For most stages I make sure that I get the classic image of the stage winner crossing the finishing line with his arms raised in jubilant triumph. 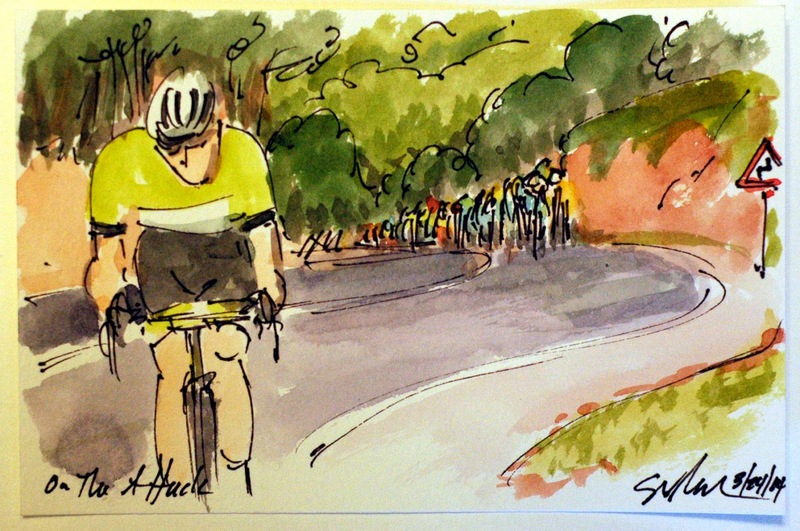 However for the final stage to be raced in the Volta Ciclista a Catalunya I felt that Lieuwe Westra's (Astana) response to Voeckler's attack on this climb and his subsequent aggressive rides up the hill was where he actually won the final stage into Barcelona. I have always marveled at how hard it must be to keep your concentration with hundreds of crazed cycling fans screaming at you as you are climbing at he very edge of your physical endurance and capabilities. So with the final climb up, Westra secured his and his team's stage win. However, his victory and the second place finish of Marcus Burghardt (BMC) and the third of Thomas Voeckler (Europcar) did nothing to change the final podium placings of the overall. 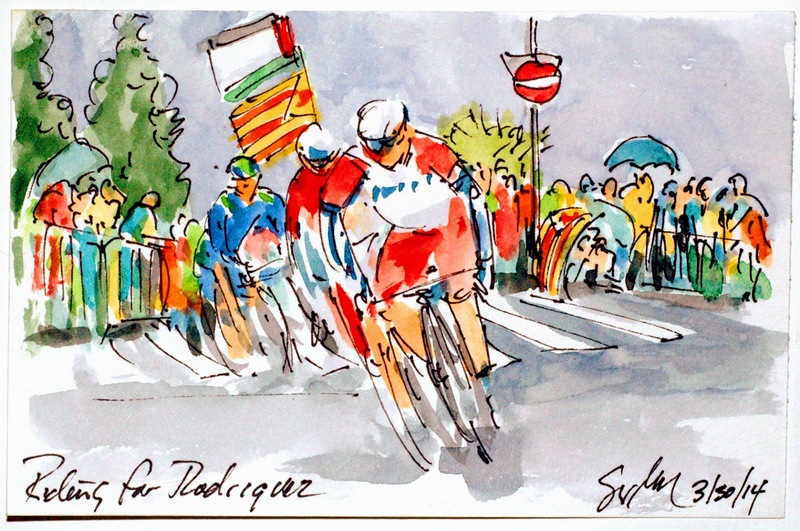 So today the overall goes to Roaquim Rodriquez (Katusha) with Alberto Contrador (Tinkoff Saxo) settling for second, even though he tried one last attack on this same climb, and third going to TeJay Van Garderen (BMC). This is an original watercolor and ink postcard that can be yours by being the first to visit my artist website at www.greigleach.com. For this particular painting just follow the direct link at the end of this post. So, chapeau to Rodriquez and Westra, and for all of those that competed. Be sure to check back here for Paris Roubaiz in two weeks. Once they had shucked the other four of the break, it was time to start thinking about taking the stage. Thomas Voeckler (Europcar) who has made a name for himself going on long breaks on some steep climbs, was the first to attack his fellows. 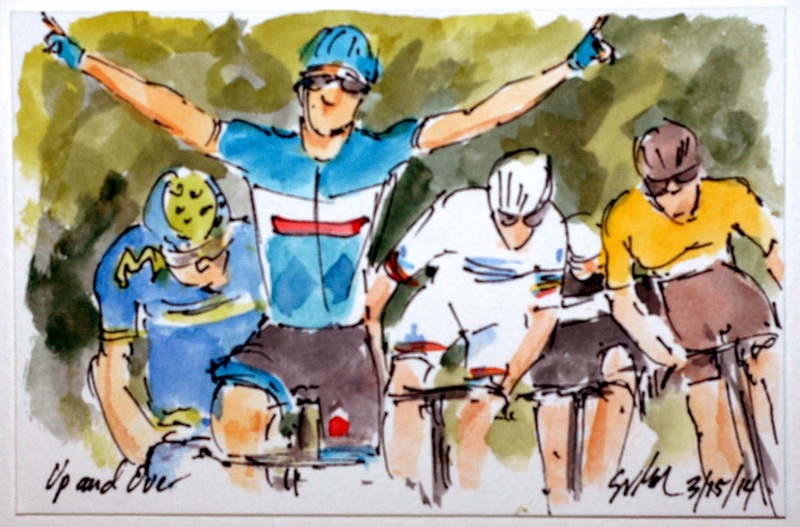 He had seen that Marcus Burghardt (BMC) was weak on the climbs and strong on the flats, he also knew that Lieuwe Westra (Astana) is a two time Dutch Time Trial Champion and had already proved earlier that he is on good form in this Volta. 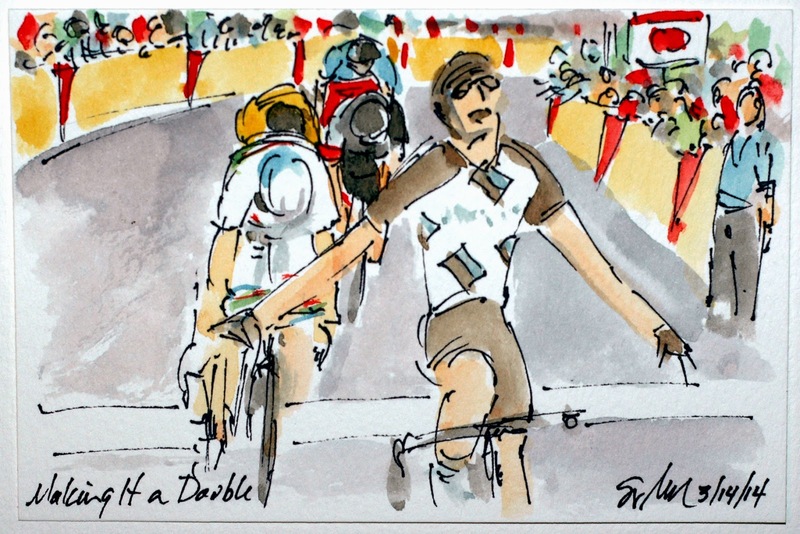 He was successful in getting a gap, but then as they crested the steep climb, Westra countered his move and no one was able to catch his wheel, not then or until he had come to a stop after crossing the finish line. This is an original watercolor and ink postcard that can be yours by visiting my artist website at www.greigleach.com, or you could just follow the direct link at the end of this post. 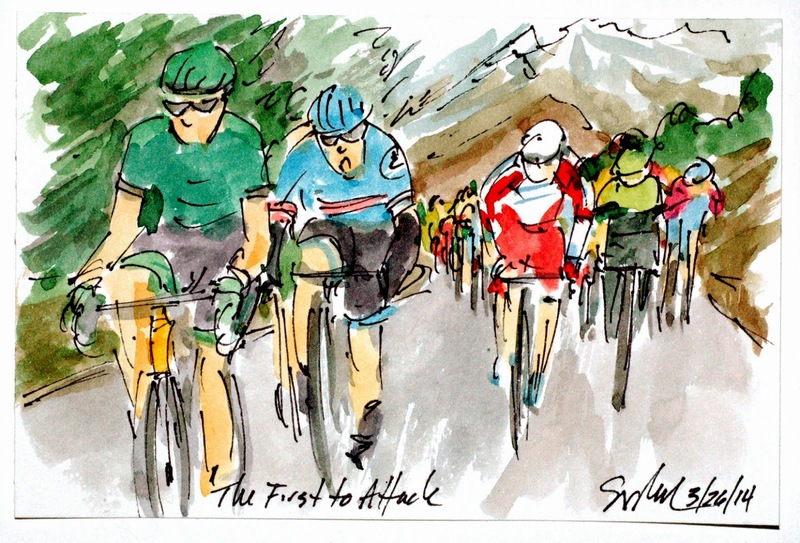 The original break consisted of nine riders, not all of whom were or possible could continue to contribute to the success of the break, so Marcus Burghardt (BMC) was the first to attack the break hoping to shed himself of the passengers and weaker riders. The aggressiveness of his attack was covered by Marciej Paterski (CCC-Polstat Polkowice), Lieuwe Westra (Astana) and Cedric Pineau (FDJ). Moments later, as they started up the climb, Thomas Voeckler (Europcar) bridged across, leaving the other four that included the winner of Stage 6, Stef Clement (Belkin Pro Cycling). This is an original watercolor and ink postcard that can be yours by being the first to visit my artist website at www.greigleach.com. For this particular painting, just follow the direct link at the end of this post. Team Katusha had a very simple task for the day, don't let anyone get far enough up the road to take away Joaquim Rodriquez's White and Green Leader's Jersey. The job may have even been simpler with the large break up the road that was grabbing all of the bonus seconds in the intermediate sprints and if they stayed away to the end, even those at the finishing line. They did have to worry about two strong climbers (TeJay Van Garderen - BMC and Alberto Contrador - Tinkoff Saxo) that were a combination of seven seconds down and the course included eight short steep climbs, the final topping out with just two and a half kilometers to the line. This is an original watercolor and ink postcard that can be yours by being the first to visit my artist website at www.greigleach.com. For this painting follow the direct link at the end of this post. 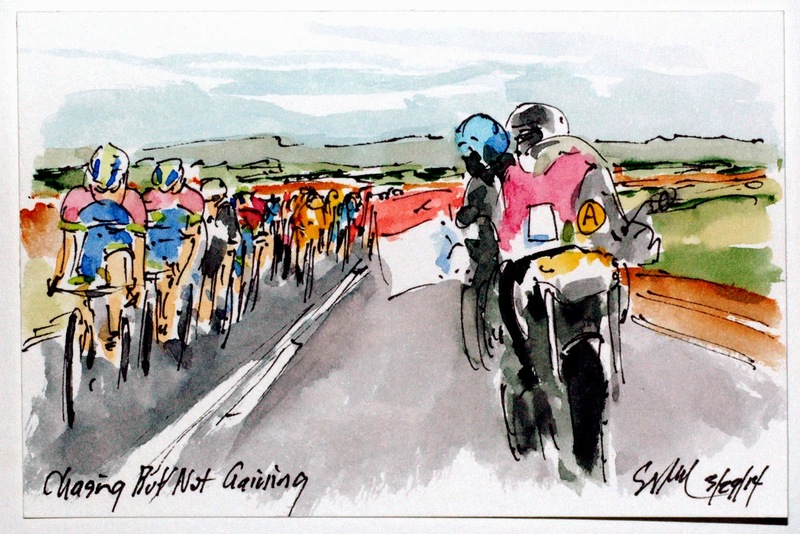 For the second time in as many days a large group of nine riders got away from the peloton and were just over three minutes to the good as they road down the highway to the finishing circuit in downtown Barcelona. With all of the GC men in the peloton and the closest man in the break over four minutes down, there was no real reason for those behind to put in a real hard chase. And like yesterday seven different teams were represented in the break including the teams that had yet to win a stage in this running of the Volta Ciclista a Catalunya. This is an original watercolor and ink postcard that was created using Yarka St. Petersburg watercolors and Steve Quiller brushes from www.richesonart.com. 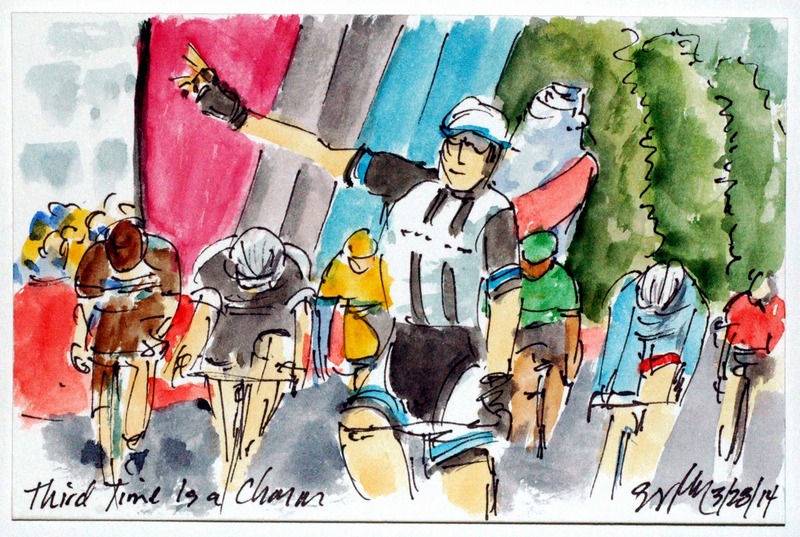 In addition, this painting and all of my cycling art is available through my artist website at www.greigleach.com. For this particular piece you can follow the direct link at the end of this post. Unlike the Tour de France, the King of the Mountains jersey in the Volta Catalunya is a red jersey, not the spots of most races. Also unlike most King of the Mountain Jersey wearers, it is unusual for to see the jersey cross the line first on a relatively flat stage. With the original break away attacking and regrouping over the last 10 kilometers of the race, it came down to who could make an attack at the right time, and make it hard enough that no one could stay with them. Today it was Stef Clement (Belkin Pro Cycling) who went just inside of the flame rouge (one kilometer to go), and went so hard that no one could catch his wheel. 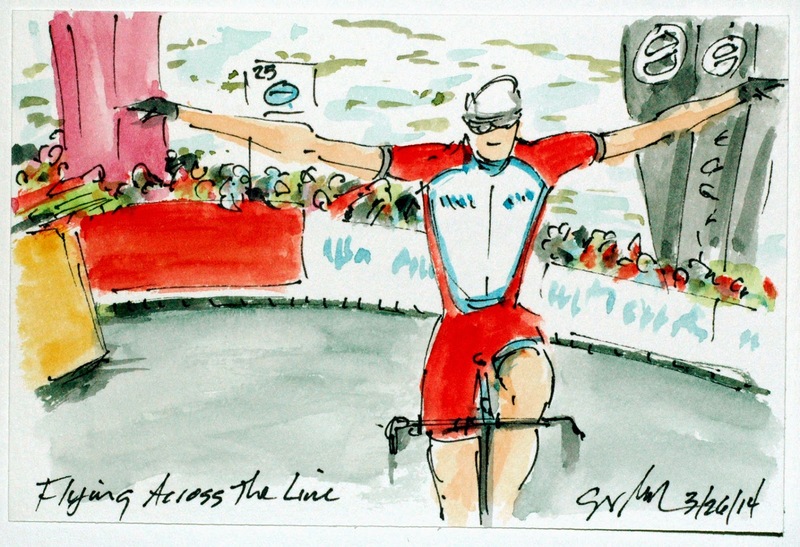 So while wearing the KOM jersey, he threw his arms in the air in victory, with no one else within site of the TV camera. This is an original watercolor and ink postcard that could be yours by being the first to visit my artist website at www.greigleach.com. For this painting follow the direct link at the end of this post. The break away worked well because all nine riders worked hard and together to stay away from the peloton, but once they were inside of the last 10 K of the 172 kilometer stage the attacks began. 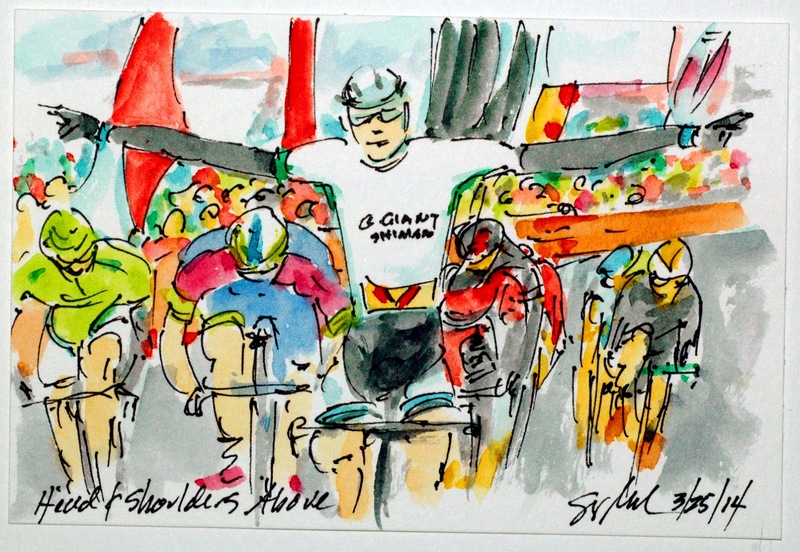 The commentators were surprised that it was the senior of the group, Jens Voigt (Trek Factory Racing) who fired the first volley across the others collective bow. Jens rolled through his turn to the back of the group and then surprised everyone by jumping from the back where no one could see him until he was up to full speed. Once he had attacked and been caught it was all bets off with attack after attack coming from most of the riders in the break. This is an original watercolor and ink postcard that could be yours by being the first to visit my artist website at www.greigleach.com. For this painting follow the direct link at the end of this post. Today with a break up the road the peloton couldn't figure out whose job it was to do the chasing. First Giant Shimano did the work with hopes of getting yet another stage victory with their sprinter, Luka Mezgec, then Katusha came up just to make sure the break didn't get over six minutes, protecting their leader's jersey. Finally it was Lampre that came up to work in hopes of getting a win for their team, wanting to get something in the books for this edition of the Volta Ciclista a Catalunya. This is an original watercolor and ink postcard that can be yours by being the first to visit my artist website at www.greigleach.com for this painting follow the direct link at the end of this post. While you are there, why not browse around all of the art on offer? Another stage, another break away, but this one had a few extra things in its favor. First it was a large group of nine riders, two, while they were strong the best placed rider was over eight minutes behind the race leader and, three, nine of the 22 teams in the race were represented in the group. So this group was off with some big break away riders including the old man of the peloton, Jens Voigt (Trek Factory Racing) Pierre Rolland (Europcar) and Rudy Molard (Cofidis) and an up and coming Aussie, Damian Howson (Orica GreenEdge). 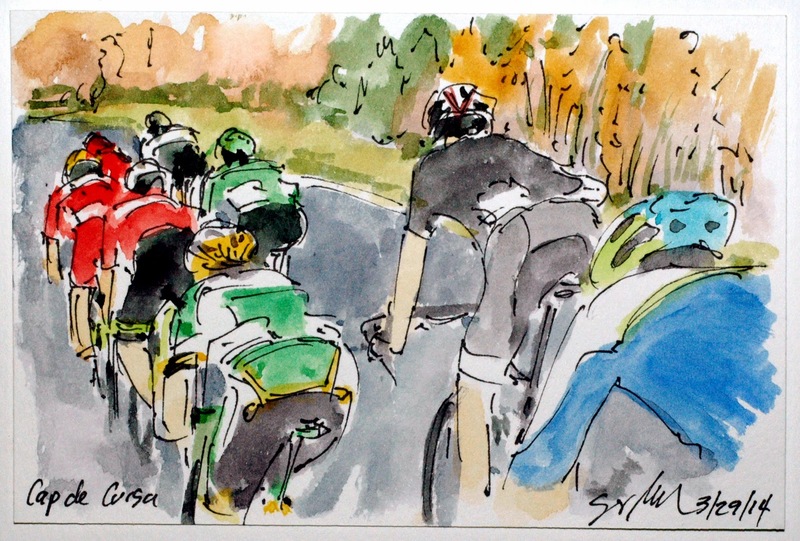 Maybe today will be the day that the peloton never sees the riders in the break until they are all back at the hotel. 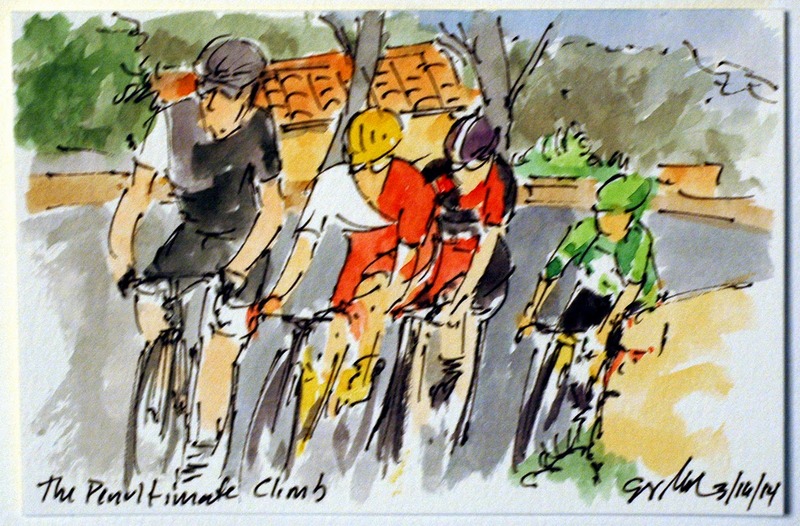 This is an original watercolor and ink postcard that has been created using Yarka St. Petersburg watercolors and Steve Quiller brushes from www.richesonart.com In addition this, and all of my cycling art in this blog, are available from my artist website at www.greigleach.com. For this particular painting follow the direct link at the end of this post. A big climb near the end, the GC men fighting to get the bonus seconds on offer and a stiff head wind on the way into the final kilometer, it didn't look to be a day for the sprinters and it certainly didn't look like the only sprinter to win a stage could make it three out of five total stages. Luka Mezgec (Giant Shimano) is proving himself to be another fine Slovak sprinter who can also get over the climbs. However, the big climbs of stages 3 & 4, proved too tough for him to be close enough in GC to pull back on the leader's jersey he earned with his first two victories. This is an original watercolor and ink postcard that could be yours by being the first to visit my artist website at www.greigleach.com. For this painting, follow the direct link at the end of this post. Just because everyone expects you to attack, it doesn't mean that it won't work. Although Alberto Contratdor (Tinkoff Saxo) trailing Joaquim Rodriquez (Katusha) by just four seconds may have left it a little late in the final climb. He may of been relying to heavily on his descending skills. His jump from the peloton was first cover by the man in fourth place, Romain Bardet (AG2R) and then they were quickly marked by Damian Howson (Orica GreenEdge), Nairo Quintana (Movistar) - who is tied on time with Bardet, and the race leader, Rodriquez. 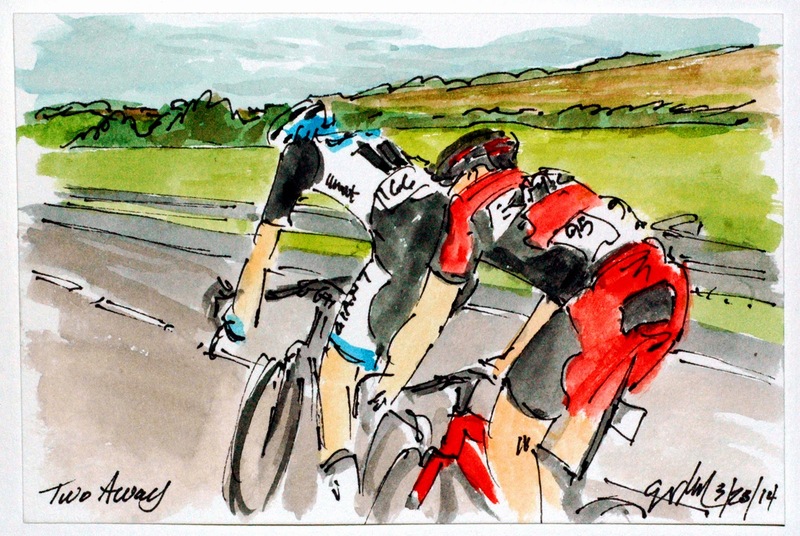 This important move washed away Lieuwe Westra (Astana) and Ryder Hesjedal (Garmin Sharp). This is an original watercolor and ink postcard that could be yours by being the first to visit my artist website at www.greigleach.com, for this painting just follow the direct link at the end of this post. Volta Catalunya Stage 5: Do I Have a Gap? As expect, the attacks did come on the final climb, first from Ryder Hesjedal (Garmin Sharp) quickly followed by Lieuwe Westra (Astana) and it was his attack that looked like it had the staying power. He might have had a chance had, Alberto Contrador (Tinkoff-Saxo) sitting second overall, hadn't decided to lay down an attack. This is an original watercolor and ink postcard that can be yours by being the first to visit my artist website at www.greigleach.com, for this painting follow the direct link at the end of this post. The peloton hit the base of the Alt de Lilla, the final climb of the day, all together, but with just seconds separating the top ten positions, it would most likely not still be together at the summit. All the more so because form the crest of the climb it was only 8 kilometers to the finish in Valls and it was all downhill. Team BMC, Cannondale, FDJ, and Movistar were all at the business end of the peloton setting it up for their GC men. This is an original watercolor and ink postcard that can be yours by being the first to visit my artist website at www.greigleach.com, for this painting, just follow the direct link at the end of this post. After awhile the two leaders, Burghardt (BMC) and Preidler (Giant Shimano) were joined by two more, however only Pierre Roland (Europcar) was able to hang with the two in the stiff winds. Apparently the winds are frequent enough to warrant the installation of wind turbines. However the break that got away after 50 kilometers was all for naught as the peloton reeled them in with only about 20 K left to ride. This is an original watercolor and ink postcard that is available from my artist website at www.greigleach.com, or for this painting just follow the direct link at the end of this post. After two days of high mountain climbs, cold rain, snow the racers were blessed with sunshine and a relatively flat stage. However they spent the day in pretty stiff winds, most of them headwinds. I went out for a ride myself and hit very stiff head winds, too, and you end of working as hard as you can yet feel like you are barely moving. Even with those conditions a large break got away, with these two, Marcus Burghardt (BMC) and Georg Preidler (Giant Shimano) slipping off of the larger group trying to beat the odds and the peloton. 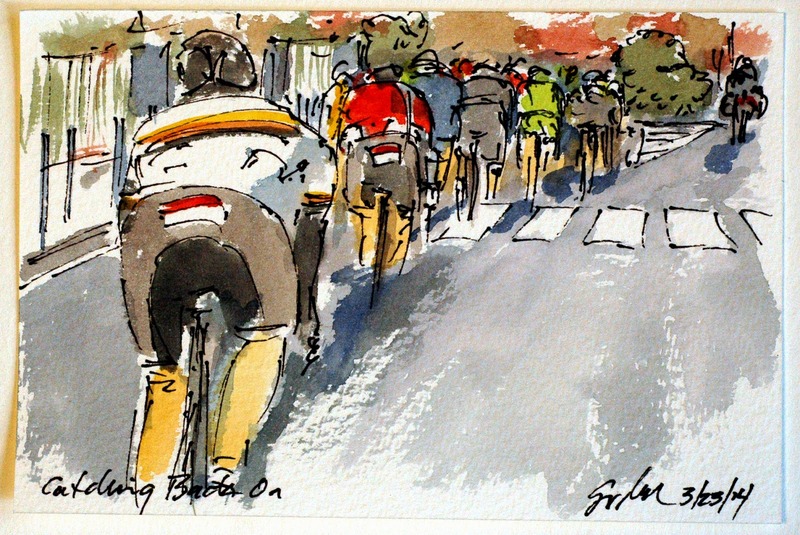 This is an original watercolor and ink postcard that has been created using Yarka St. Petersburg watercolors and Steve Quiller brushes from www.richesonart.com Also, this painting and all of my cycling works are available from my artist website at www.greigleach.com. For this particular painting you can follow the direct link at the end of this post. Cycling is not like baseball, they will race in virtually anything Mother Natures throws at them. The only exception to that is if the roads are too icy to be safe for the riders to make the fast paced descents that are the reward for the seemingly impossible climbs. However, technology is not as versatile. With low lying clouds, rain and snow, the moto cameras weren't able to bounce their signals to the helicopters or the plans, the helicopters couldn't get under the cloud cover to show the riders, so today was TV free racing. The only images available were from fixed cameras station near the finish line right next to the production vehicles. 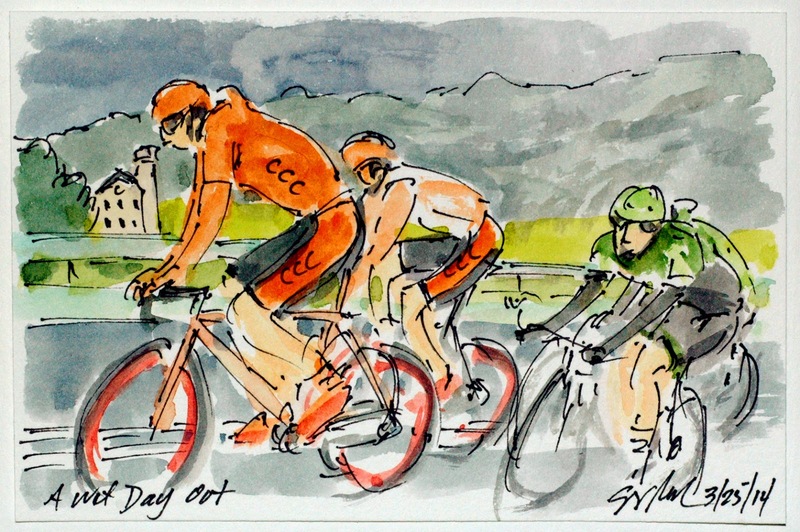 So here is the only painting of Stage 4 of the Volta Catalunya, and for us Americans, it was a nice one to get. 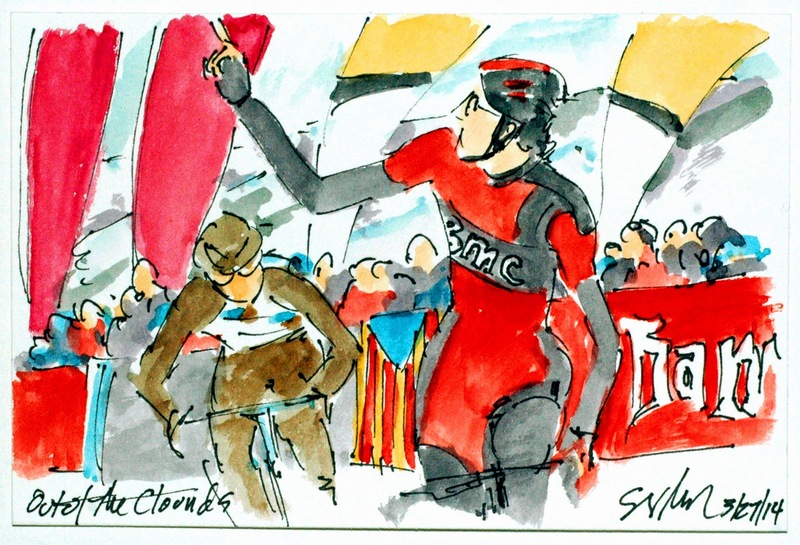 TeJay Van Garderen (BMC) showed that he is back from early season illness and in to his Alp d'Huez form as he slipped by Romain Bardet (AG2R) for the stage win. Rodriquez kept the leader's jersey and the rest of the GC simply tightened up the time gaps. So there is a lot of racing yet to come. 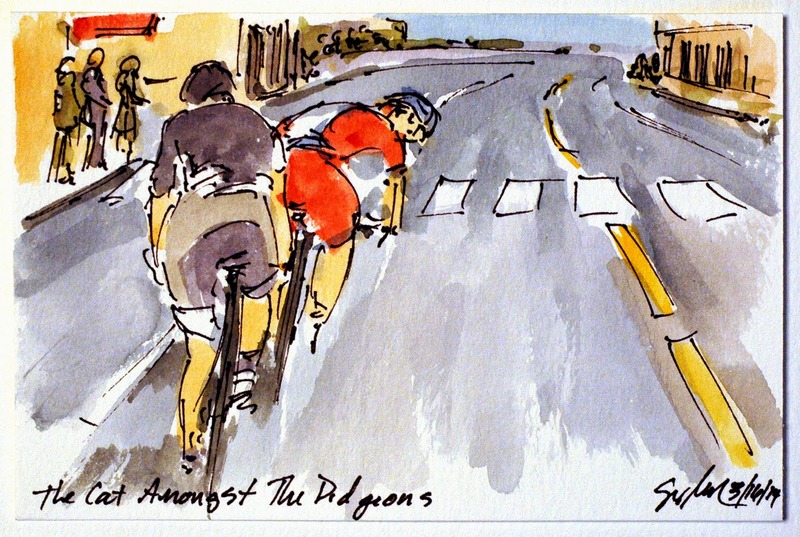 This is an original watercolor and ink postcard that was created using Yarka St. Petersburg watercolors and Steve Quiller brushes from www.richesonart.com In addition, this painting and all of my cycling works, is available from my artist website at www.greigleach.com. For this particular piece follow the direct link at the end of this post. Team Katusha had worked hard chasing back the break, put riders on the front in the cross winds, and finally used Daniel Moreno to chase down the last attacks he could, all for their leader, Joaquim Rodriquez. So when Chris Froome attacked and Contrador, Quintana went after him it was up to Rodriquez to catch them all and take the stage victory in honor of his team's hard work. 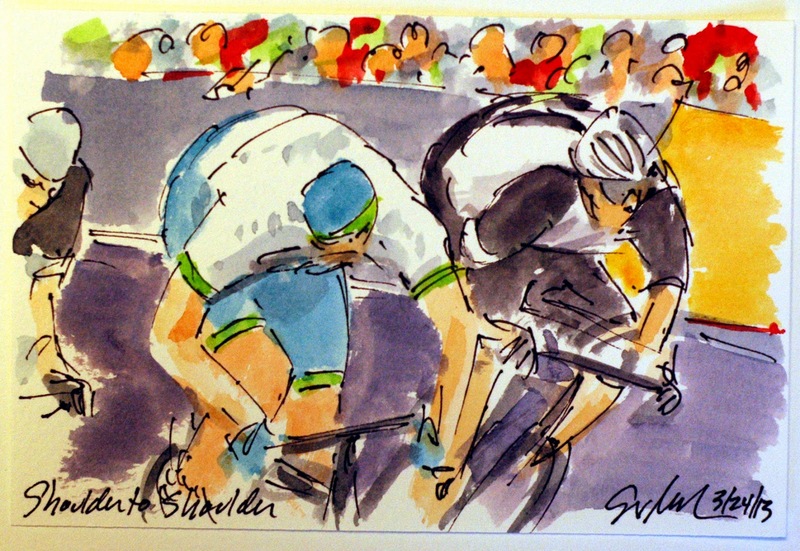 The convincing win (notice no one else is even in site), beating the closes competitor, Contrador, by seconds was more than enough to let him pull on the leader's jersey and spray the spectators with Champagne. This is an original watercolor and ink postcard that is available at my artist website, www.greigleach.com. Or for this painting just follow the direct link at the end of this post. Once Kevin Reza (Europcar), the last of the early break was picked up, it was time for the counterattacks to start. The first out of the group was another Europcar rider, Pierre Rolland. His move was quickly covered by Andrew Talansky (Garmin Sharp) and although you can see him behind Andrew, Jakob Fuglsang (Astana). 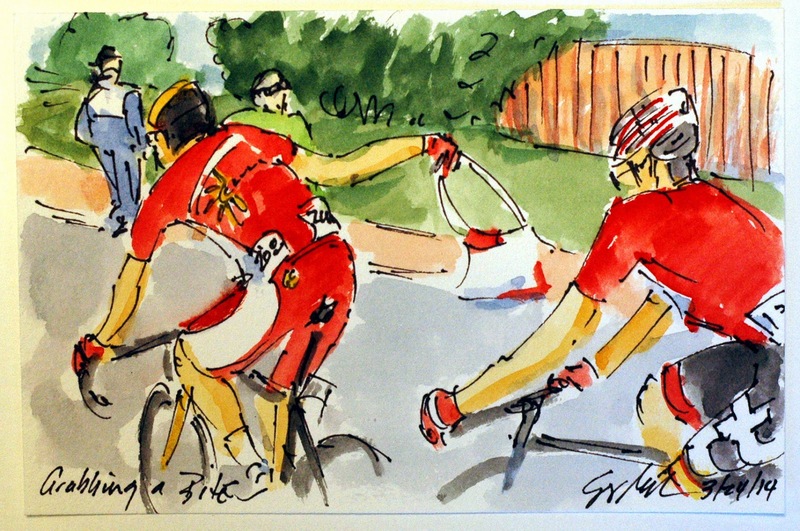 This attack was watched carefully by the faithful lieutenant of Roaquim Rodriquez, Daniel Moreno (Katusha). Katusha had worked way to hard for the Spaniard to let anyone steal the stage he had marked as his. This is an original watercolor and ink postcard that is available from my artist website at www.greigleach.com. For this painting follow the direct link at the end of this post. As the break away hit the slopes before the final climb, some of the guys from the original break legs just couldn't continue to push the pace. The pink shoulder peeking out of Michel Koch's (Cannondale) vest is that of the Intermediate Sprint Jersey, and sprinters are not known for their climbing abilities, it is no surprise that he was the first to be picked up by the peloton once it had gotten the bit between its collective teeth. This is an original watercolor and ink postcard that is available through my artist website at www.greigleach.com. For this painting follow the direct link at the end of this post. 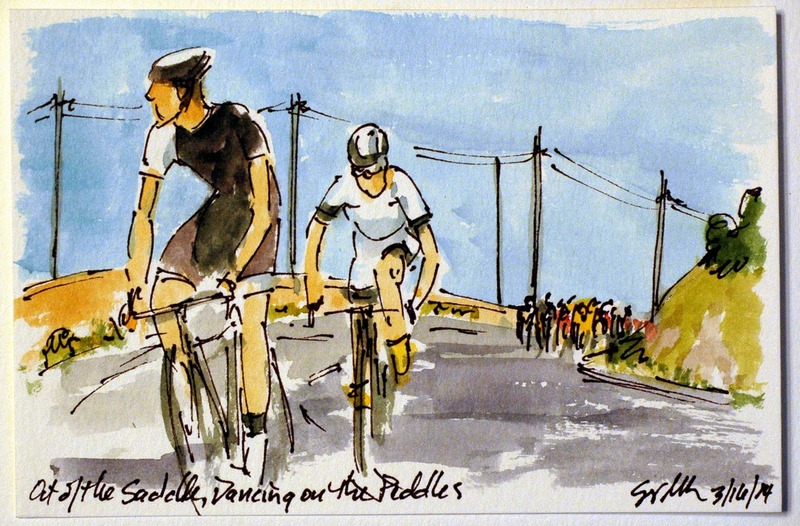 But while you are there, why not browse around all of the galleries of cycling art? The three big names for today's stage are, Nairo Quintana (Movistar), Roaquim Rodriquez (Katusha) and Alberto Contrador (Tinkoff-Saxo) so it is up to their teams to go to the front of the peloton and pull back the break away. The title is a little pun on "follow the leader" since here it is the team leaders that are follow the domestiques of their teams. While the break had almost 10 minutes at this point, by the valley before the last climb of the day, their teams had pull the break back inside of 3 minutes. This is an original watercolor and ink postcard that is available through my artist website, www.greigleach.com. For this particular painting, follow the direct link at the end of this post. 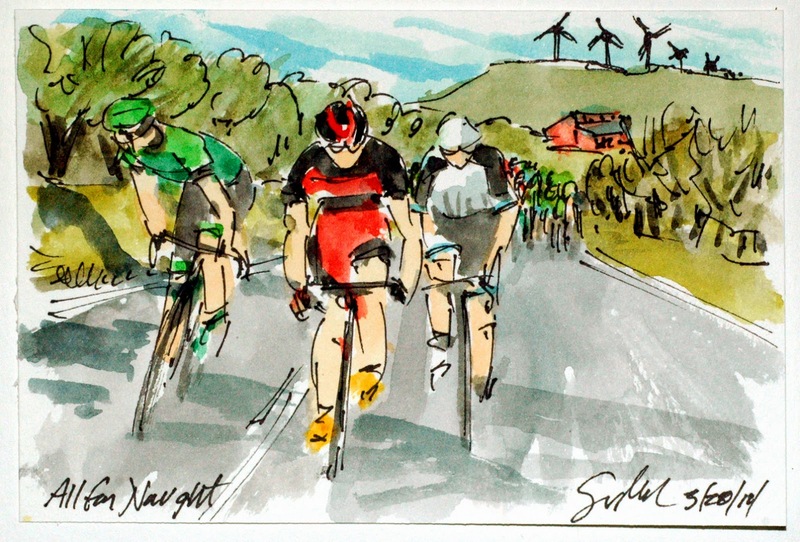 Volta Catalunya Stage 3: Do You Have Another One? Today I had the opportunity to avoid riding in the cold strong winds of March (spending time riding a stationary bike instead), but that was not an option for the peloton today. The riders were facing temperatures hovering around freezing and strong winds. When you combined the two and add in fast descents off of mountains, the wind chill factor became bone chilling. 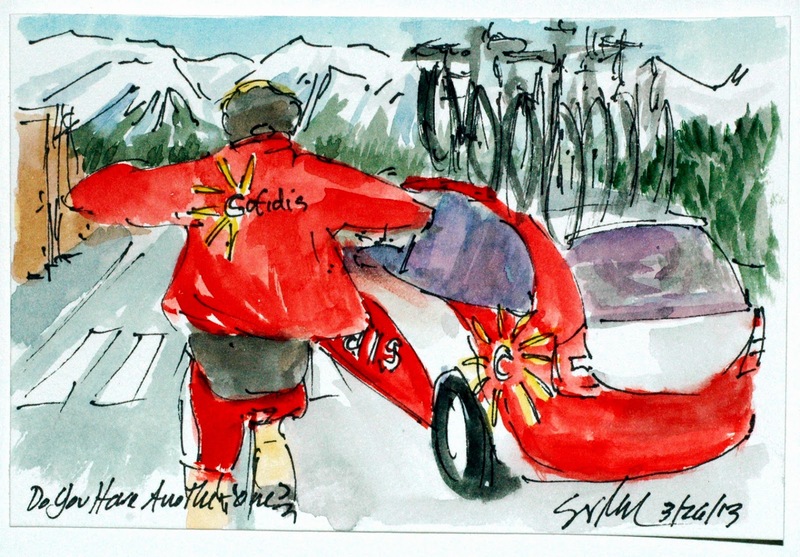 Rudy Molard (Cofidis) has just gotten another coat from the team car. I don't know if you can see that he already has a black wind breaker on over his jersey and arm warmers. The riders spent a good deal of time layering up for the descents and stripping down for the climbs. This is an original watercolor and ink postcard that could be yours by visiting my artist website at www.greigleach.com. For this particular painting follow the direct link at the end of this post. 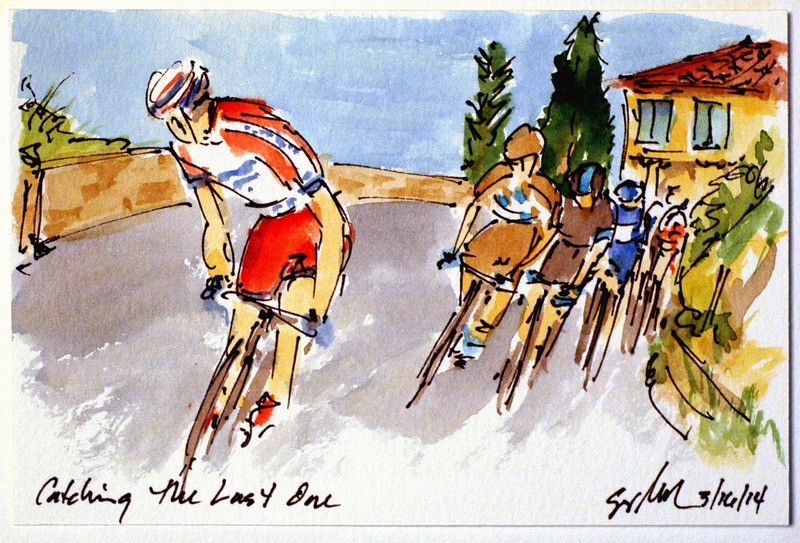 While you are there why not browse around all of the cycling art on offer? Another stage means another early breakaway up the road. This group of six got away at the nine kilometer mark and built themselves an advantage of slightly over ten minutes. I think the peloton was too concerned with trying to stay warm then they were with chasing down the break. Jack Bobridge (Belkin Pro Cycling) having been the first over the first climb of the day was checking with the team car and his director sportif, to see how he should go about winning the KOM points over the beyond category climb of the Alt de La Creueta. 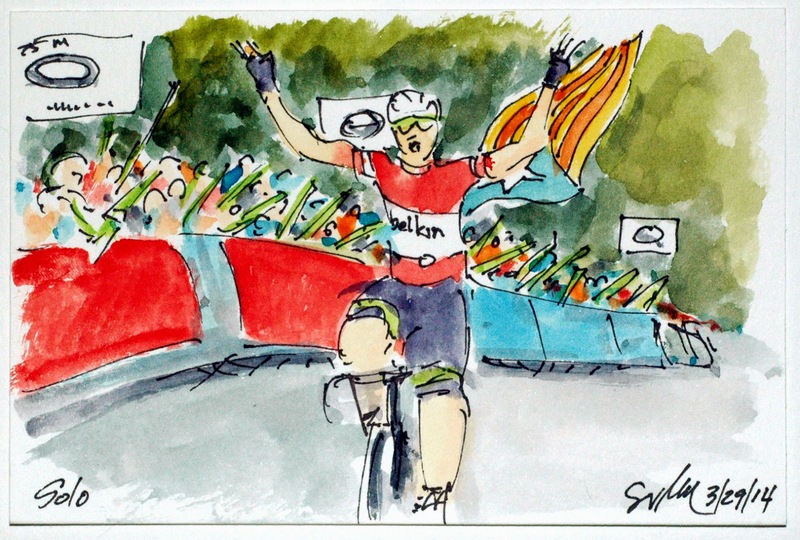 With that win he would be ensured the King of the Mountains Jersey at the end of the stage. He is joined by Michel Koch (Cannondale), Rudy Molard (Cofidis) Branislav Samorlov (CCC-Polstage Polkowice), Andrey Zeits (Astana) and Kevin Reza (Europcar) on their collective effort to steal the stage from the GC contenders. This is an original watercolor and ink postcard that was created using Yarka St. Petersburg watercolors and Steve Quiller brushes from www.richesonart.com. 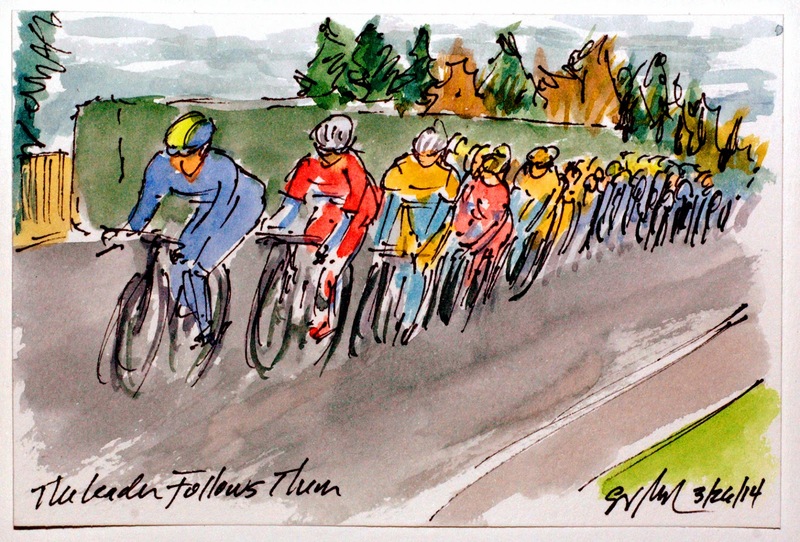 In addition, this (and all of my cycling art postcards) is available from my artist website, www.greigleach.com. For this particular painting you can follow the direct link at the end of this post. Luka Mezgec (Giant Shimano) further solidified his hold on the leader's jersey with a very strong print, crossing the finishing line in Gerona with a 15 foot lead over the next closes sprinter. With the ten second time bonus, he now has a 14 second lead over fellow sprinter, Roberto Ferrari (Lampre). Here you can see Ferrari to his right, along with Daniele Ratto (Cannondale) and Marcus Burghardt (BMC) as they all watch Mezgec give his second victory salute in as many days. This is an original watercolor and ink postcard that can by yours by visiting my artist website at www.greigleach.com. Or for this particular painting, you could just follow the direct link at the end of this post. With the peloton having gotten to almost a minute behind and just one more climb on the horizon, Thomas Voeckler (Europcar) simply road the other five members of the early break off of his wheel. Oddly, they were on a wide open long false flat and none of the others could stay with him. Voeckler has a reputation for long breaks, it was in the Tour de France when he won the hearts of every Frenchman when he held the Yellow Jersey for 10 days, even once they got into the Pyrennes and none other than Lance Armstrong was the one trying to take it off of his shoulders. Add to that, the comical faces that he pulls as he suffers up long climbs and tries to hold off a charging peloton, he is one of my favorites in today's Pro Tour. This is an original watercolor and ink postcard that can be yours by visiting my artist website at www.greigleach.com. Or for this particular painting you can follow the direct link at the end of this post. The early six man break by now as lost two riders, one dropping off the pace and slipping back to the peloton, the other just road them all of his wheel, Thomas Voeckler (Europcar), hoping to solo his way to victory in the second stage of the Volta Catalunya. 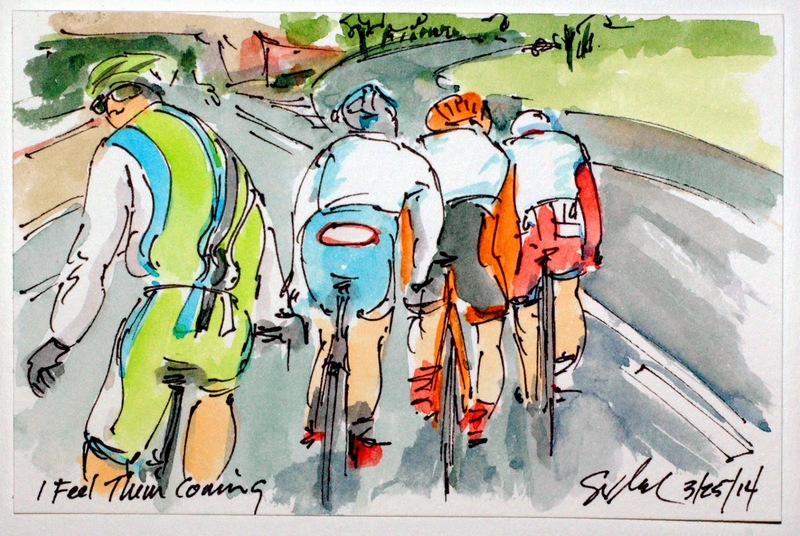 These four where unable to pull back the lone Frenchman and, Michael Koch (Cannondale) sensed that the peloton would soon be swallowing them up as they charged up the final climb of Stage 2. This is an original watercolor and ink postcard that can be yours by visiting my artist website at www.greigleach.com. For this particular painting, you can just follow the direct link at the end of this post. Professional cyclist spent an inordinate amount of time on their bikes, often 6 to 8 hours a day, so it is an extension of their bodies. It is as easy for them to dress or undress on a rainy road at 40 kph as it is for you or I to change a jacket while walking down the street. I, however, don't have that much confidence that I won't hit the pavement if I were to try this. 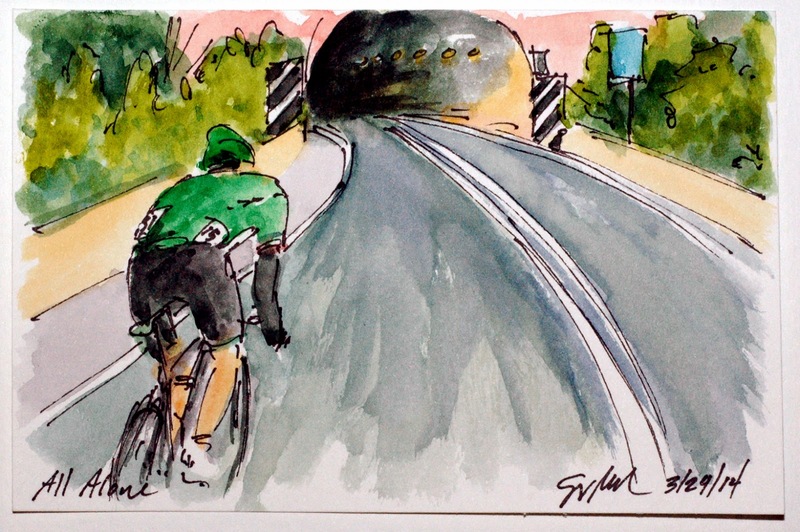 Here it is Michael Koch (Cannondale) pulling on a rain cape in hopes of keeping out the relentless cold rain that accompanied is fellow break away companions on the road to Gerona. This is an original watercolor and ink postcard that could be yours by visiting my artist website, www.greigleach.com, or you could just follow the direct link at the end of this post. When I think of Catalunya and Spain, I think of heat, sun and dry weather, not so for stage 2 of the Volta Ciclista a Catalunya. 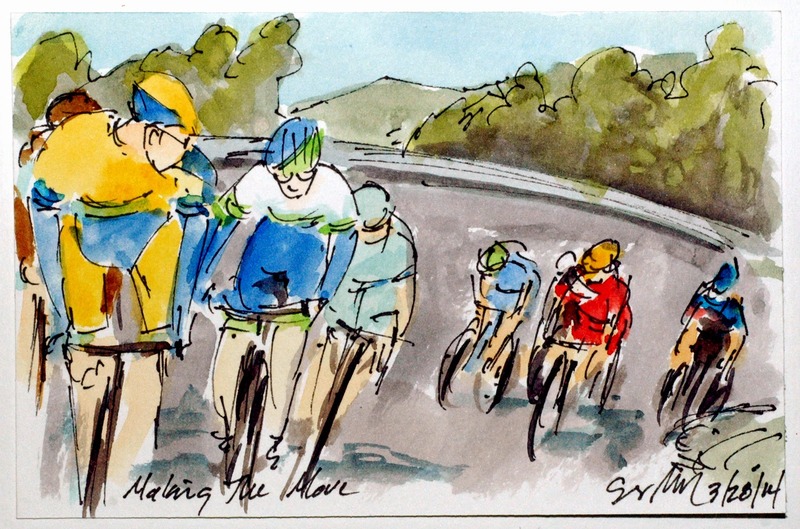 The riders spent 168 kilometers in cold rain, sometimes heavy sometimes a mere mist, but always spraying up from the wheels of the tires in front of them. A group of six got away early including two of the wild card teams, these are two of the riders from CCC Polstat Polkowice, Tomasz Marczynski and Marek Rutkiewicz. 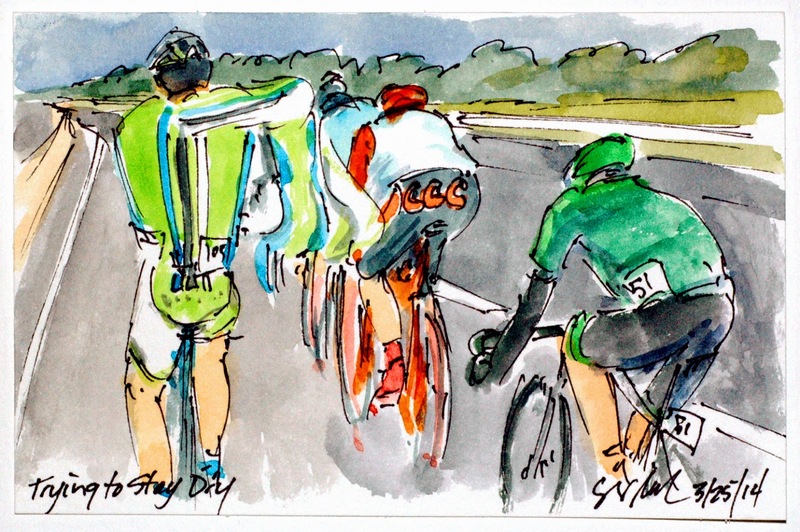 They are joined in this painting by Thomas Voeckler (Europcar) and the others in the break included; Maxim Belkov (Katusha), Michael Koch (Cannondale) and Jerome Baugnies (Wanty-Groupe Gobert). 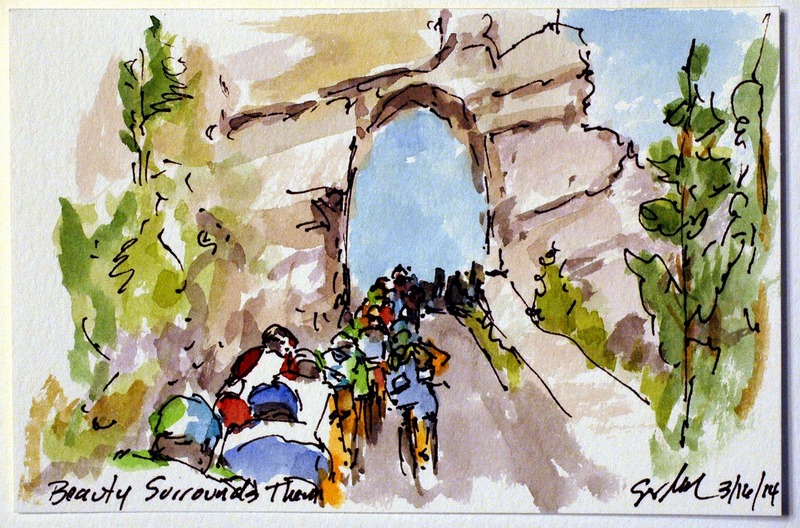 This is an original watercolor and ink postcard that was created using Yarka St. Petersburg watercolors and Steve Quiller brushes from www.richesonart.com In addition this painting and all of my cycling art is available through my artist website at www.greigleach.com. For this particular painting, you can just follow the direct link at the end of this post. Once the peloton had done it's job and sucked up all of the aggressive breaks since the top of the final climb, it was up to the sprinter's teams to get their man in the right position. It should make for interesting atypical sprints with most of the marquee names skipping this race in favor of yesterday's Milan-San Remo. Plus this stage race features quite a number of tough climbs and two mountain top finishes, not exactly the terrain of the speeders of the final kilometer. So it was Giant Shimano and Orica GreenEdge bringing their sprinters, Luka Mezgec and Leigh Howard to the final meters to fight it out. Today the race was Luka's and the win on the first stage puts him into the leader's jersey for the next stage of the Volta Catalunya. This is an original watercolor and ink postcard that can be yours by visiting my artist website at www.greigleach.com or you could just follow the direct link at the end of this post. 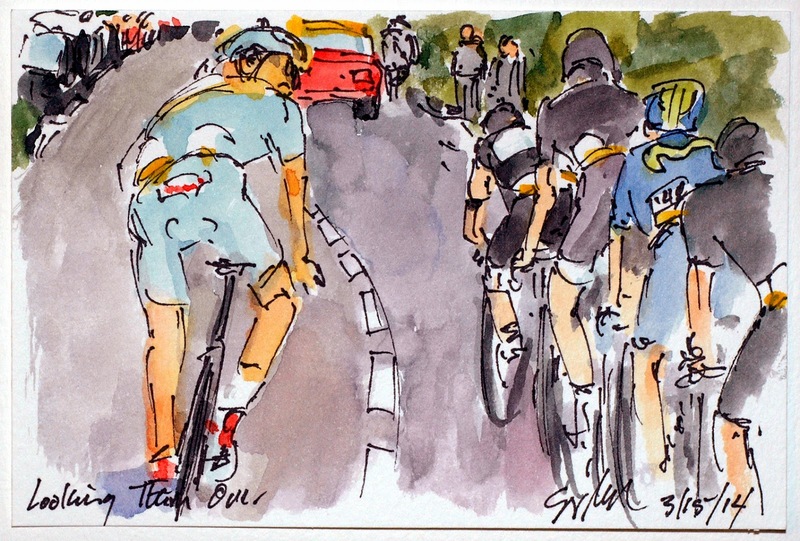 The title for this little painting is a quote from one of the broadcasters on www.cycling.tv as he was referring to this late attack by these three in the last kilometer of the final climb. They, Mikael Cherel (AG2R), Wilco Kelderman (Belkin Pro Cycling) and Romain Hardy (Cofidis) were hoping to be able to use the fast descent into the costal town to stay away from the peloton. It was looking good for the three until two of them goofed a turn in a roundabout at the base of the hill. Kelderman got the direction right, but it only delayed the nearly sure fire catch by the peloton and the sprinters. This is an original watercolor and ink postcard that can be yours by visiting my artist website at www.greigleach.com or for this particular painting, you could just follow the direct link at the end of this post. Another seemingly basic requirement of the peloton is that as soon as the day's break is caught someone must immediately go on the attack. 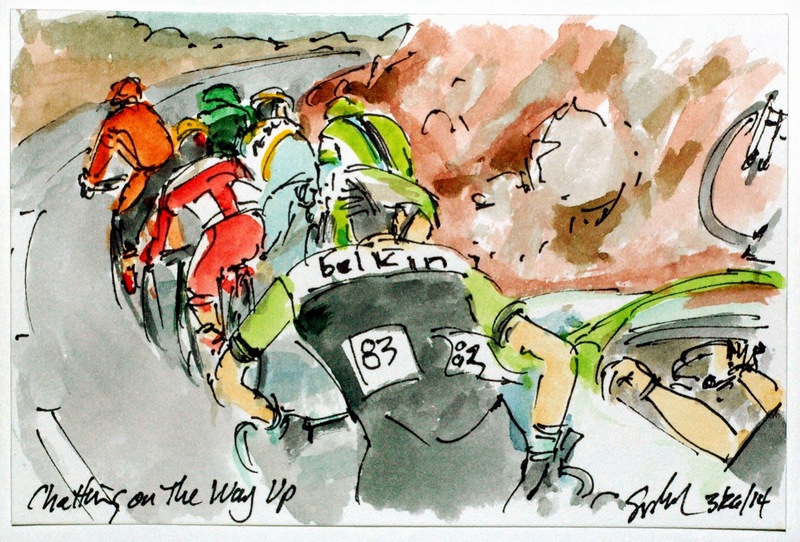 And true to form as soon as the early two and the later joiner were caught, Paul Martens of Belkin Pro Cycling jumped from about a quarter of a way down the line to launch a rather aggressive move on the final climb of the opening stage of the Volta Catalunya. He may have been laying down a common team tactic of sending one rider up the road for another to use as a carrot and a spring board. This is an original watercolor and ink postcard that could be yours by visiting my artist website, www.greigleach.com. Or for this particular painting, you could just follow the direct link at the end of this post. It appears to be an unwritten rule that the riders in the wild card teams must be present in every break away in every stage of every race. Unfortunately for Amets Txurruka of Caja Rural-Seguros RGA, they did make it into the early two man break, so he jumped from the peloton on the category one climb of the day in search of the others up the road. 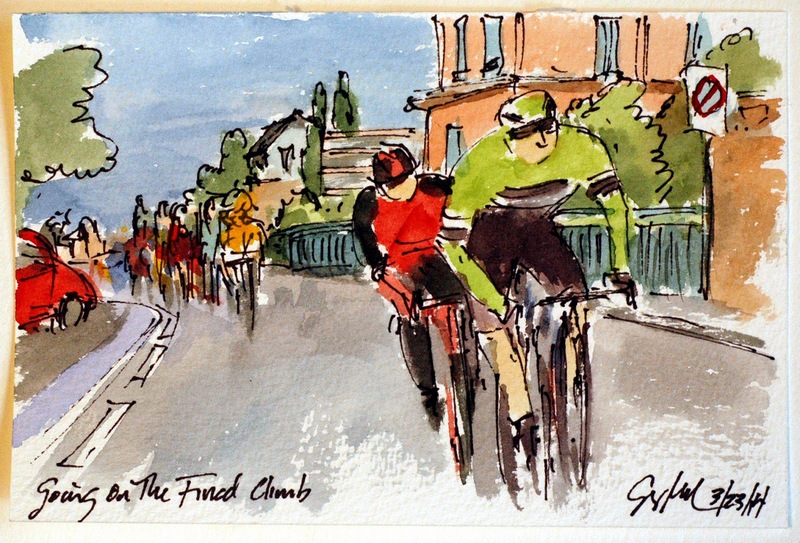 He did make it near the base of the final climb, but none of them were able to stay away all of the way up the climb. This is an original watercolor and ink postcard that is available for purchase at my artist website, www.greigleach.com. Or for this particular painting you could just follow the direct link at the end of this post. On every long stage the racers will burn over 6,000 calories so it is of the upmost importance that they keep the machine of their bodies fed. Along the course of each stage their is a designated "feed zone" where the team helpers will stand along the side of the road handing out musettes, bags of food and drink that the riders grab as they whiz by. 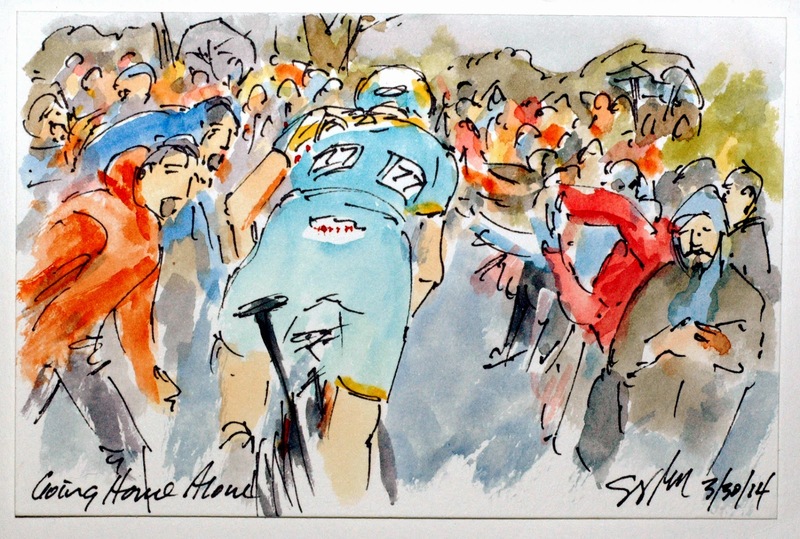 The musettes are designed to be easily grabbed and then slung over their shoulders as the rider transfers the goodies to his pockets and gets back to racing and eating. Here the early two man of Romain Lemarchand (Cofidis) and Boris Vallee (Lotto-Belisol) break are the first to get to lunchtime. This is an original watercolor and ink postcard that has been created using Yarka St. Petersburg watercolors and Steve Quiller brushes from Jack Richeson and Co. (www.richesonart.com). 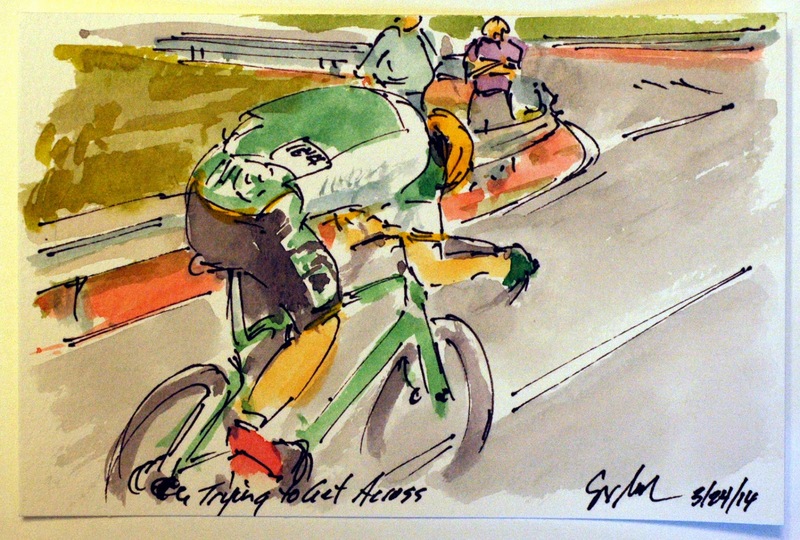 This, and all of my cycling paintings, is available through my artist website, www.greigleach.com, or for this painting you can just follow the direct link at the end of this post. Some of the big name sprinters got over the final climb on the run in to San Remo, but only Team Katusha brought enough riders to form a lead out train for their man, Alexander Kristoff. 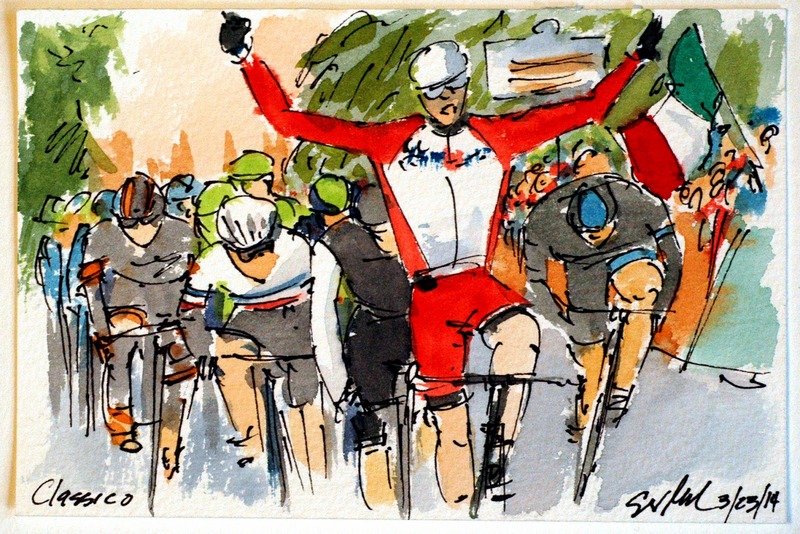 He is now the first Norwegian to throw his arms in the air for the win at Milan-San Remo. 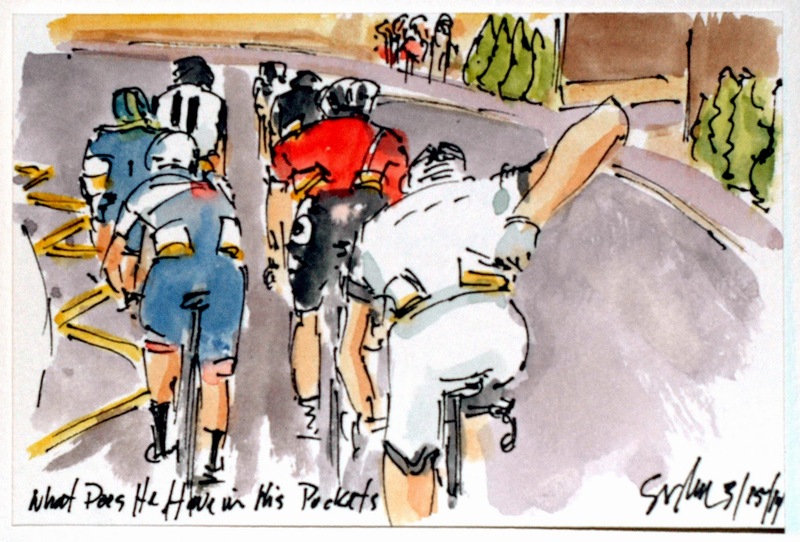 He had enough to hold off the fabled classics rider, Fabian Cancellera (Trek Factory Racing), and the sprinters, Ben Swift (Team Sky) and Mark Cavendish (OPQS). 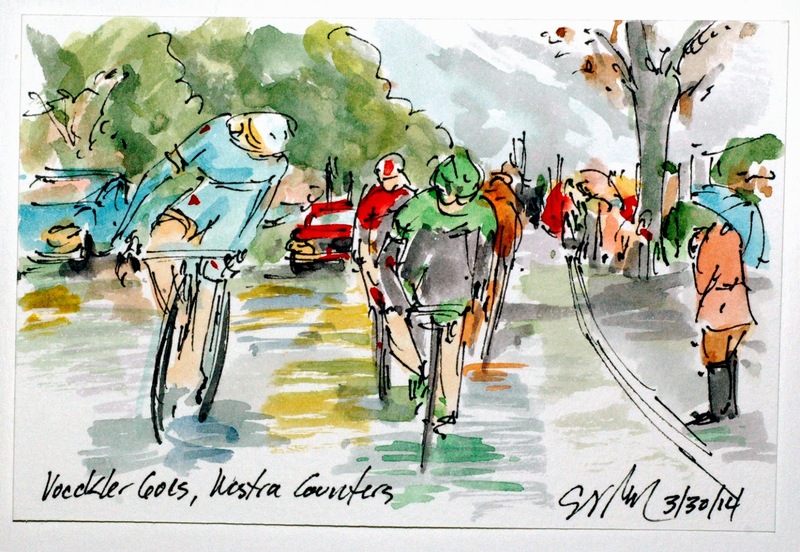 It was a convincing win after riding for over six hours in rain, cold and even hail for the jubilant Kristoff. This is an original watercolor and ink postcard that can be yours by visiting my artist website, www.greigleach.com. Or for this particular painting you can just follow the direct link at the end of this post. 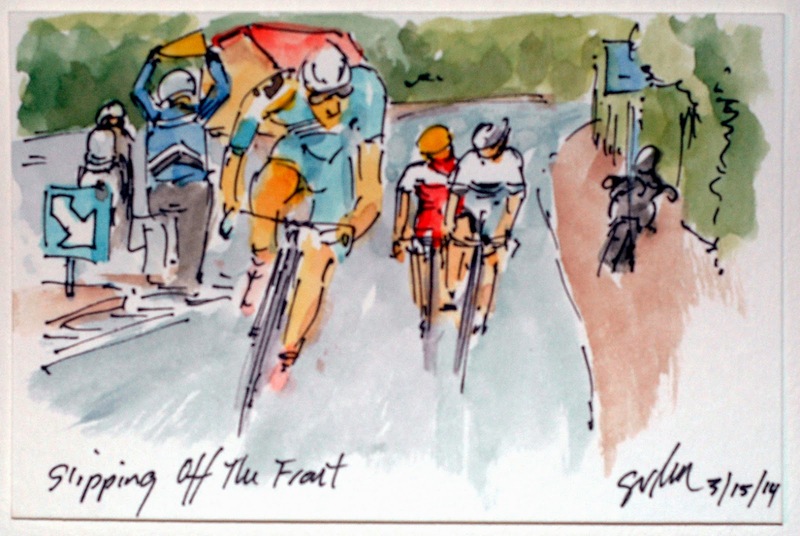 Starting tomorrow I will be painting the Volta Ciclista Catalunya, so come back to see the race through the eyes of this artist. As I have said in the previous post, if you aren't a sprinter, it is best to attack the peloton on the Poggio with the hopes of getting rid of the marque sprinters like Andre Greipel (Lotto-Belisol). Here you can see him just tagging back on to the rear of the fast moving peloton with about 3K left to race. The effort to stay with the pack on the way up, and the energy spent chasing back proved to leave Greipel without the legs to contest for the win of Milan-San Remo. 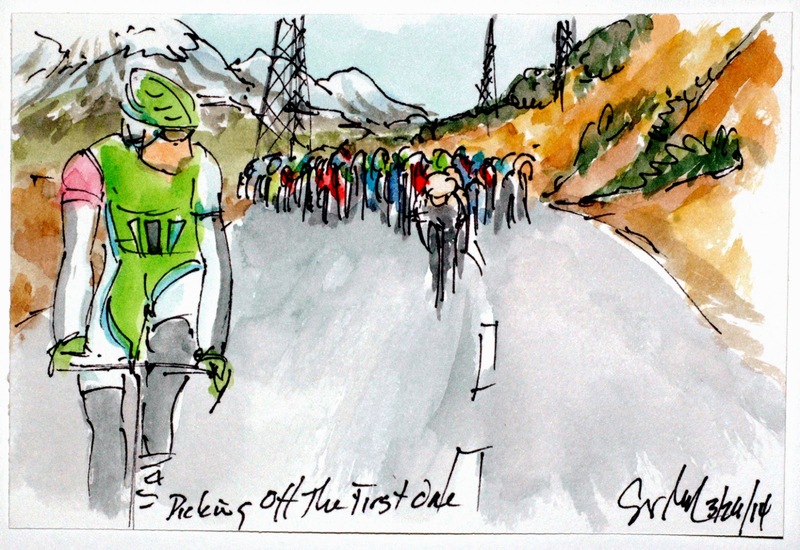 Oddly Peter Sagan, one of the best climbing sprinters, wasn't at the front end of the peloton either. I never did see what happened to him, although some green clad riders went down on the final corner of the race. This is an original watercolor and ink postcard that can be yours by visiting my artist website, www.greigleach.com. For this particular painting you can follow the direct link at the end of this post. In Milan-San Remo if you are not a sprinter, you have to get rid of the fast men on the final climb of the day, the Poggio. The other option, go out in front and let your team leader bridge up to you for the win. I do think it was the former for Greg Van Avermaet (BMC) and Lars Petter Nordhaug (Belkin Pro Cycling). With roughly 7K to go and maybe 2K to the summit of the Poggio the pair were able to get away and can about ten seconds over the top, most likely not enough to hold off the sprinter's trains. This is an original watercolor and ink postcard that is available for purchase through my artist website, www.greigleach.com. For this particular painting, just follow the direct link at the end of this post. Milan-San Remo, at one point the racers were pelted with hail. None of that dampen the attacking fever of the winner of last year's Giro d'Italia (a race that included snow storms in May), Vincezo Nibali (Astana), as he jumped out of the Cannondale led peloton on the climb of Cipressa. He may of been expecting some one to join him in the effort, but instead pressed on alone in a long solo effort that came to naught. This is an original watercolor and ink postcard painted using Yarka St. Petersburg paints and Steve Quiller brushes from Jack Richeson and Company (www.richesonart.com). 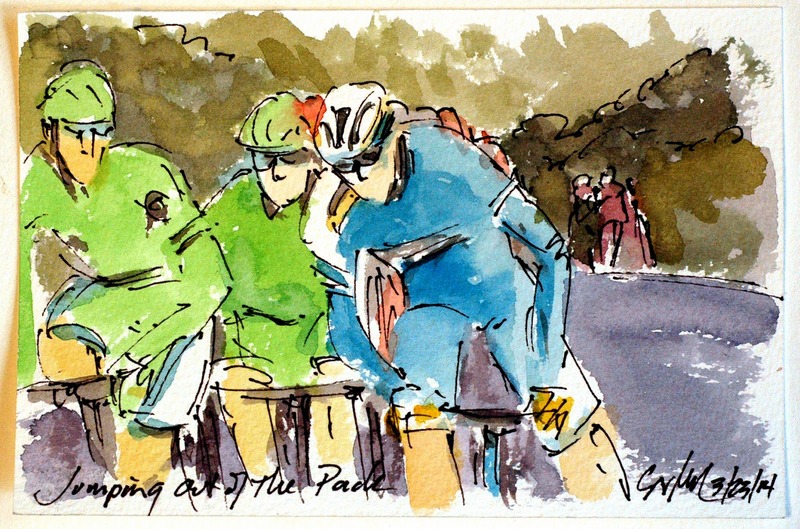 In addition this work is available for purchase, along with most of my cycling art postcards, at my artist website, www.greigleach.com. For this painting you can just follow the direct link at the end of this post. This has been a wonderful Paris Nice for the French. The French team AG2R claimed the Yellow Jersey for their man, Carlos Betancur, both Team Bretagne and Europcar lit up the breakaways nearly every stage and Sylvan Chavanel wore the Polka Dot Jersey for two days. 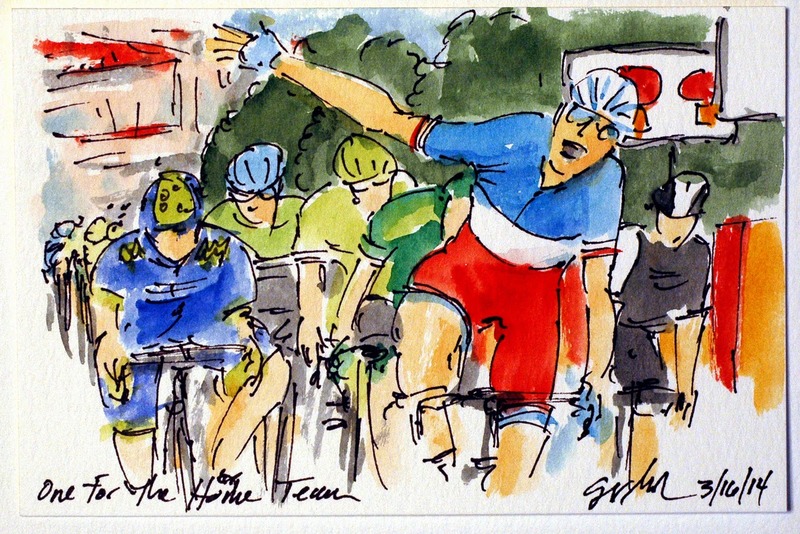 But the ultimate feather in the cap was Arthur Vichot (FDJ - another French team) winning on the Boulevard des Anglais wearing the Tri-Colour Jersey of the French National Champion. This was truly a race for the home team. It does make you wonder how the French will fair in the Tour de France. The final standing for Paris Nice were; Carlos Betancur (AG2R) - Yellow Jersey, John Degenkolb (Giant Shimano) - Green Jersey, Pim Ligthat (Lotto Belisol) Polka Dot Jersey, Carlos Betancur (AG2R) - White Jersey (the best placed rider under 24) and Movistar for the best team. This is an original watercolor and ink postcard that could be yours by visiting my artist website at www.greigleach.com or you could just follow the direct link at the end of this post. Frank Schleck's first attempt at an attack was pulled back but he simply jumped again this time joined by Simon Spilak (Katusha). The pair came off of the final climb of Paris Nice at full speed hitting the streets of Nice with 10 seconds on the peloton. 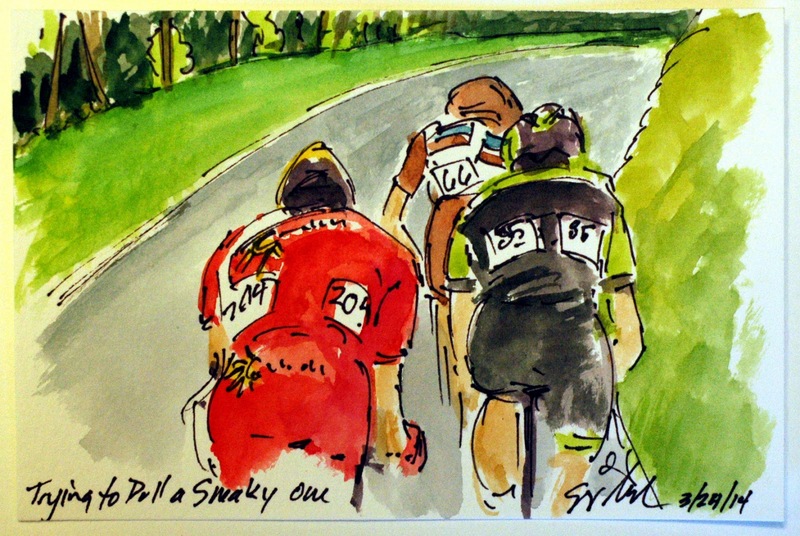 The titled of this painting is a quote from the commentators on www.cycling.tv, Marty MacDonald and Brian Smith, as they described the attack by Spilak who was only 40 seconds down on GC. Even with that incentive to catch the pair, it was a hard chase to pull this pair back before the finish line. This is an original watercolor and ink postcard that can be yours by visiting my artist website at www.greigleach.com. Or you could just follow the direct link at the end of this post. 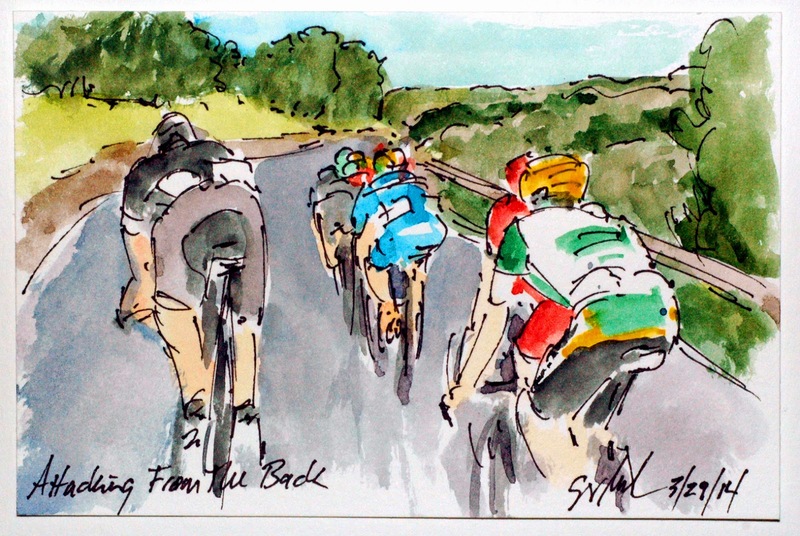 No sooner than the peloton was all back together than the attacks started up. One of the first to go was Frank Schleck of Trek Factory Racing who was quickly joined by Edvardo Sepulveda of Team Bretagne. Bretagne really raced hard in Paris Nice certainly proving them a wise choice for on of the wildcard slots. This attack was well timed coming just before the crest of the Col d'Eze allowing the pair to start the descent on their own. This is an original watercolor and ink postcard that can be yours by visiting my artist website, www.greigleach.com or you could just follow the direct link at the end of this post. With only one climb left in Paris Nice the peloton was in no mood to let any break steal their thunder so they sucked up the last of the early break on the lower slopes of the Col d'Eze. The last one to be picked up by the AG2R led peloton was Yuri Trofimov (Katusha). It must be heart breaking to have been out in the lead for 100 kilometers only to be caught with only 30 K to go. This is an original watercolor and ink postcard that is available for purchase through my artist website, www.greigleach.com or you could just follow the direct link at the end of this post. After cresting the Cote de Peille, the peloton skirted along the coastal highlands winding through some of the most beautiful roads and vistas of the South of France. For the riders, they were working far too hard to take in the scenery, with such small time gabs it was a hard day of racing that made for a very fast and dangerous descent off of the mountain top. This is an original watercolor and ink postcard that could be yours by visiting my artist website at www.greigleach.com or you could just follow the direct link at the end of this post. The final stage of Paris Nice featured two hard category 1 climbs, climbs that will finish out the 8 day stage race along the Mediterranean coast beside the port of Nice. With little roadway left and the top ten places separated by just 30 seconds, it was going to be a day of hard racing. A large break got away early in the stage but the penultimate climb of the day, Cote de Peille, was the launch pad for these four to make the first solid move of the stage. They are Matthew Busche (Trek Factory Racing), Jeome Coppel (Cofidis), Greg Van Avermaet, (BMC), and Jerome Cousin (Europcar). This is an original watercolor and ink postcard that was created using Yarka St. Petersburg Watercolors and Steve Quiller Brushes from Jack Richeson and Company, Inc. (www.richesonart.com). In addition these works are available for purchase at my artist website, www.greigleach.com or you could just follow the direct link at the end of this post. With his hands in the air, Tom-Jeffe Slagter (Garmin Sharp) becomes the second rider in this running of Paris Nice to win a second stage. He was able to get up the final steep climb up to the finishing line, just beating out Rui Costa in the Rainbow Jersey (Lampre), Jose Joaquim Rojas (Moviestar) and the Yellow Jersey of Carlos Betancur (AG2R). Costa was frustrated to claim second for the second day in a row and to be left still looking for his first victory in the World Champion Jersey. He, however, remains in second place in Paris Nice by just 14 seconds. Betancur's four place finish was enough to keep him in the leader's Yellow Jersey for the final stage into Nice. This is an original watercolor and ink postcard that could be yours by visiting my artist website, www.greigleach.com. Or you could just follow the direct link at the end of this post. 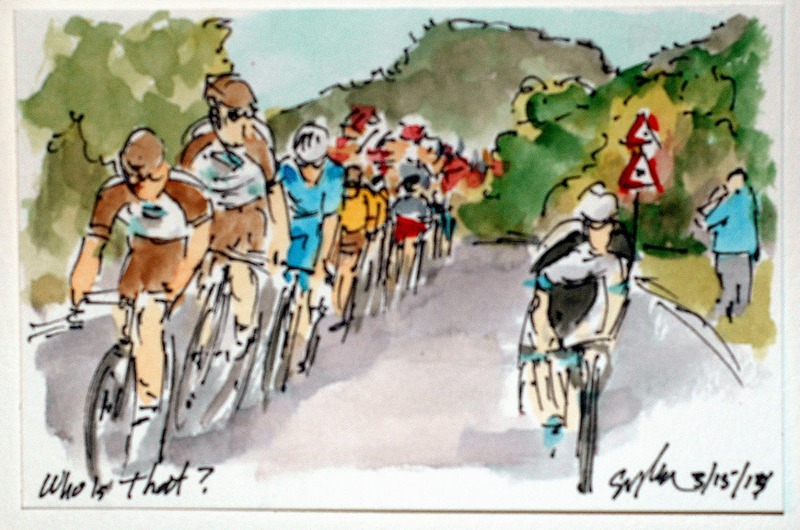 Paris-Nice Stage 7: Who Is That? AG2R, the team that has the Yellow Jersey, had to ride hard on the front to defend Betancur's Jersey and chase down any threads to his lead. You can see Villermoz look over at the attacking Dries Devenyns (Giant Shimano) to see if he was one of the riders close to his man on GC. Since he wasn't they knew they could let him go and dare one of the other teams to chase him down. While they didn't want to lose time, they also didn't need to win the stage either. It was up to the others to attack and go for stage wins in hopes of taking back the Yellow Jersey. This is an original watercolor and ink postcard that could be yours by visiting my artist website, www.greigleach.com. Or you could just follow the direct link at the end of this post. Rather than leaving the early break out to fry, today they caught the seven member break too early setting up the opportunity for a flurry of attacks within the final 20 K of the stage. This is Lieuwe Westra (Astana), Cyril Lemoine (Cofidis) and Guillou (Team Bretagne) trying to get away for the stage victory. The other story being told is off the French Gendarme who travel with the race closing the roads, dealing with the sometimes unruly crowds and warning the cyclist of dangers in the road way. 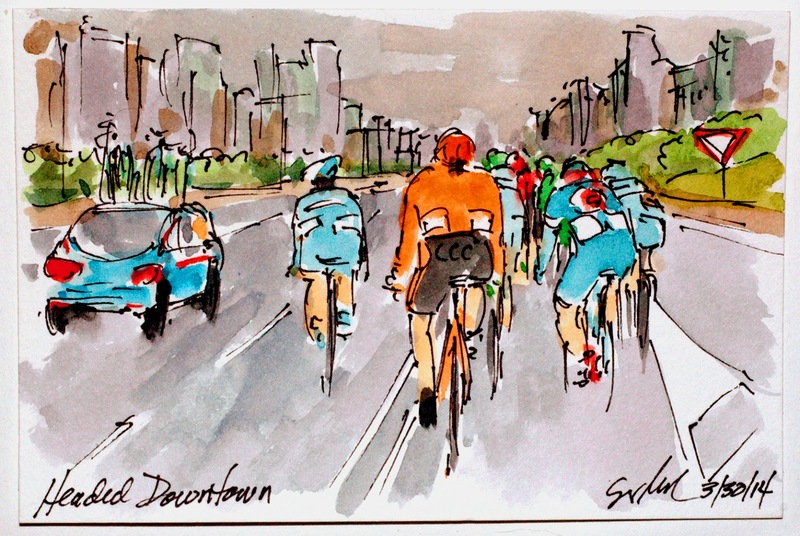 They stand in front of the charging peloton waving a small yellow pennant with their backs against the traffic islands or construction zones along the race course. This is an original watercolor and ink postcard that could by yours by visiting my artist website, www.greigleach.com. Or you could just follow the direct link at the end of this post. Cyclist will consume upwards of 6,000 calories in a single stage of racing and if they don't get it right the resulting bonk could ruin his chances for an overall placing in the GC. For those of you who may not know, cycling jerseys have three small pockets along the back (the easiest place for the riders to access). Team Bretagne continued making a presence in all put one of each stage's break away. Another rider who has benefit from getting into the break is the Lotto-Belisol rider in red, Pim Ligthart, who got over the mountains first and took over the lead in the King of the Mountains competition. Now, he will get to wear the Polka Dot Jersey into Nice on the final stage of the race. This is an original watercolor and ink postcard that can be yours by visiting my artist website, www.greigleach.com. Or you could just follow the direct link at the end of this post. With several big climbs in the middle of Stage 7, a group of 7 riders got out in front of the peloton, continuing the near perfect matching of numbers in the break to the number of the stage. When a group is working together they will create a pace line, where the first guy in line breaks the wind for a while then swings off the front and goes to the back of the line. Once in the back the rider has a chance to catch his breath while the next rider breaks the wind. 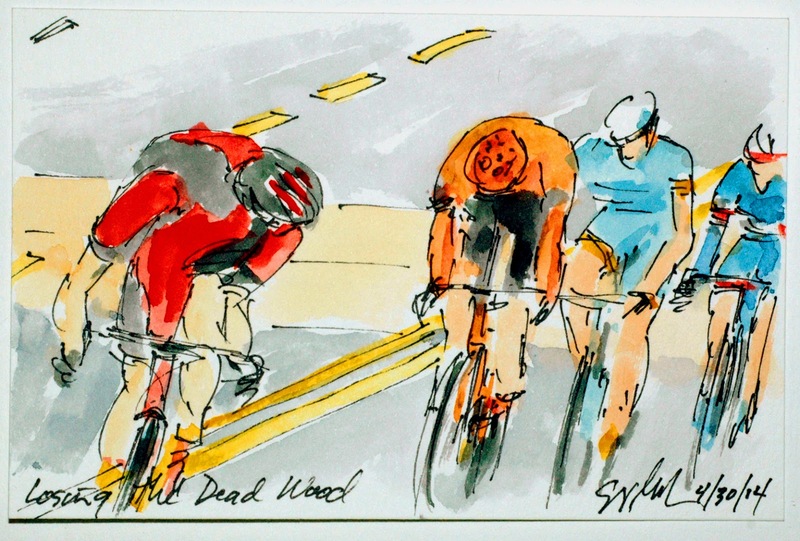 Due to the slip stream created as the wind slips around the leader the second rider uses as much as 50% less effort than the guy with his nose in the wind. 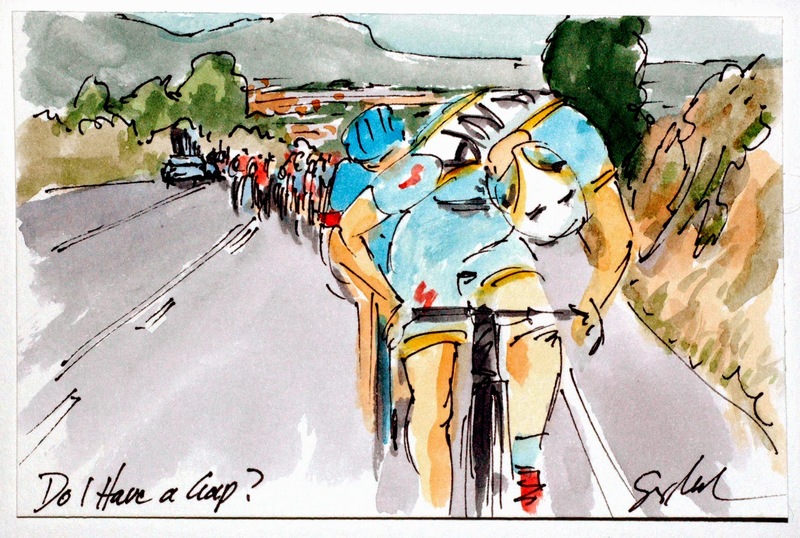 Lieuwe Westra (Astana) looks over his shoulder to find where he will be slotting in when he gets to the back. It is also a good chance to get a look at his fellow breakaway members to assess their remaining strength. This is an original watercolor and ink postcard created using Yarka St. Petersburg cake watercolors and Steve Quiller brushes both from Jack Richeson Company, Inc. (www.richesonart.com). Also, this work is available for purchase from my artist website, www.greigleach.com or you could just follow the direct link at the end of this post. Naturally, if you and your team have been aggressive throughout the stage you really want to finish it off with a victory. Even more so if the victory is the second one in a row and it wins you the Malliot Jaune. So while AG2R rider, Alexis Villermoz crash within site of the finishing line, it was his teammate, Carlos Betancur, that got the better of the Rainbow Jersey of Rui Costa (Lampre), Geraint Thomas (Sky) Arthur Vichot (FDJ) and Zdenek Stybar (OPQS). Between the bonus seconds for winning the stage and Stybar nipping Thomas at the line to gain the final bonus seconds available for the stage, Betancur gain enough time to take over the Yellow Jersey of race leader. This is an original watercolor and ink postcard that is available for purchase through my artist website, www.greigleach.com. Or you could just follow the direct link at the end of this post. As I have said AG2R was most aggressive in Paris Nice today and sensed weakness in Team Sky, so once the next breakaway had been caught (containing one of their own), the Director Sportif called all of the team to the front of the peloton and told them to ride and ride hard. They were riding to the benefit of Carlos Betancur who started the day just 9 seconds down on the Yellow Jersey of Simon Geraints (who you can see at the back of the group). 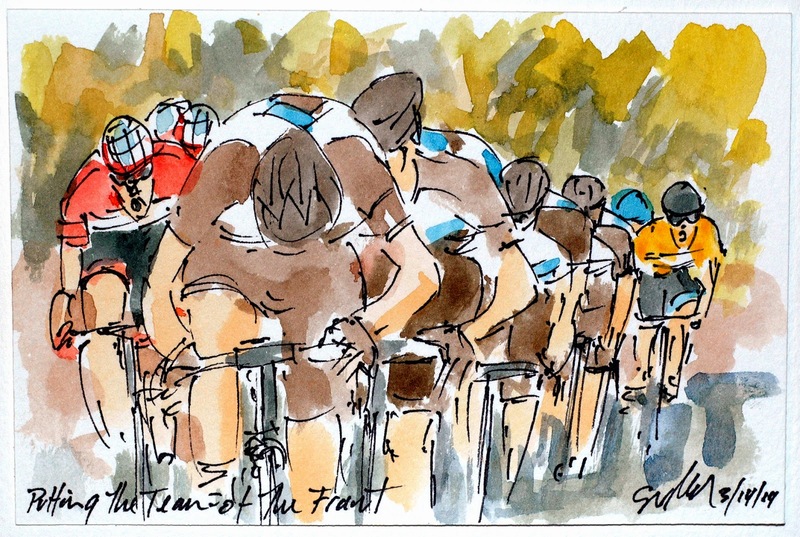 AG2R has hit the 2014 season with renewed vigor hoping to reclaim French cycling's reputation. This is an original watercolor and ink postcard that is available through my artist website, www.greigleach.com. Or you could just follow the direct link at the end of this post. 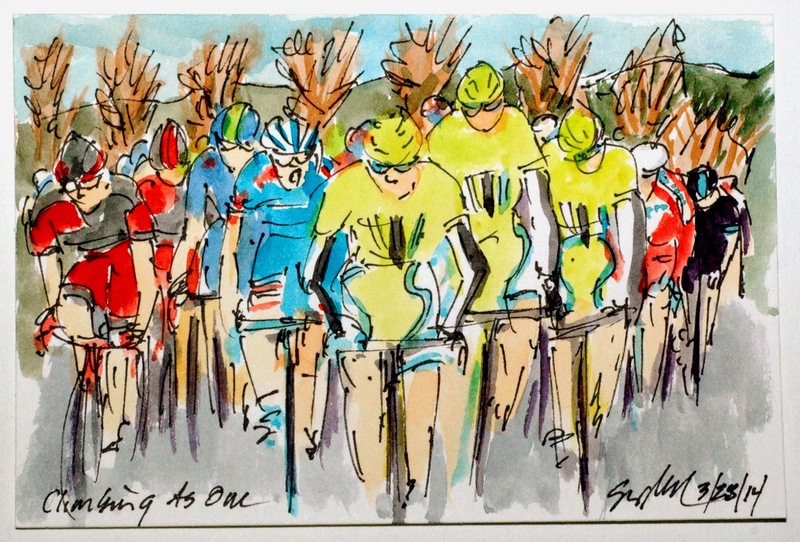 Paris-Nice Stage 4: Who Is Still There?